Plenty of sunshine and warmth Sunday afternoon pushed temperatures across northern Illinois and southern Wisconsin into the upper 70s and low 80s. Rockford reached 80 degrees for the first time this season/year. This actually isn't too far from when we typically achieve our first 80 degree day. The long-term average for the first 80 degree day in Rockford typically occurs on or around Aprill 22nd. The last time the temperature was 80 degrees, or higher, was last October 7th, 2018. 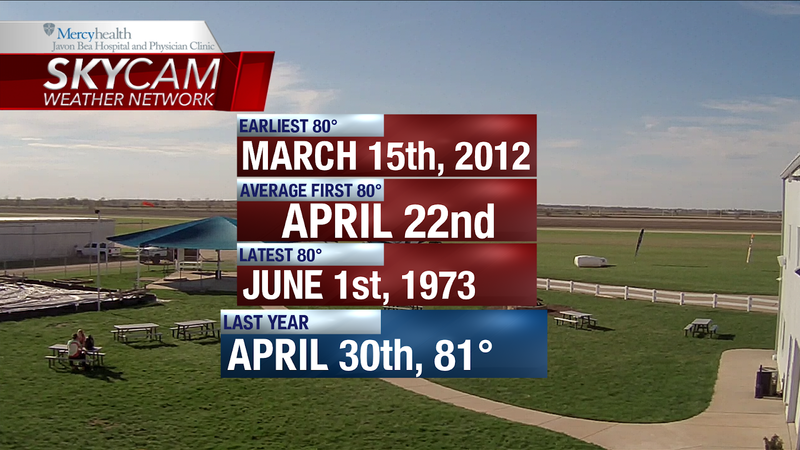 The earliest the temperature has reached 80 degrees was back on March 15th, 2012. The latest Rockford ever reached 80 degrees was June 1st, 1973. Monday will be another warm, summer-like, afternoon. 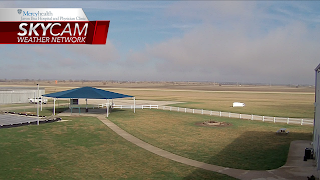 A little more cloud cover during the afternoon will keep temperatures from hitting the 80 degree mark, but highs should warm into the mid and upper 70s. 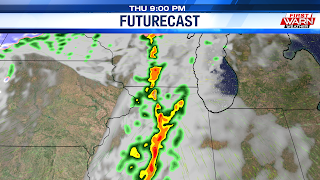 Showers and thunderstorms will be possible ahead of a cold front late afternoon and evening. Winds shifting around to the south Sunday morning will give temperatures a nice little boost during the afternoon, bringing highs into the mid and upper 70s! High pressure centered over the western Great Lakes Saturday left most of the Midwest with northing but sunshine and warmth. Officially the high in Rockford reached 68 degrees! 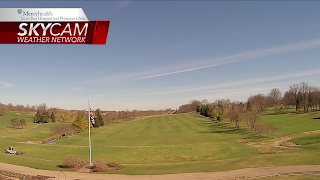 Clear skies continue into Easter Sunday morning with temperatures starting off in the mid 40s. Winds will increase a little during the afternoon pulling in a very warm air mass. This will bring temperatures into the mid 70s for most, if not the upper 70s to near 80 degrees Sunday afternoon. 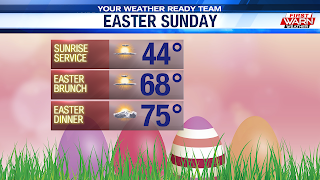 Since Easter doesn't fall on the same day every year there is no 'normal high' for that day. 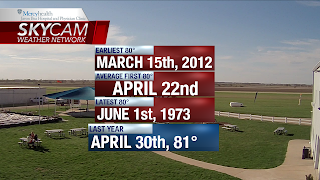 The warmest Easter day ever recorded was April 12th, 1925 and April 10th, 1977 when the temperature reached 84 degrees. 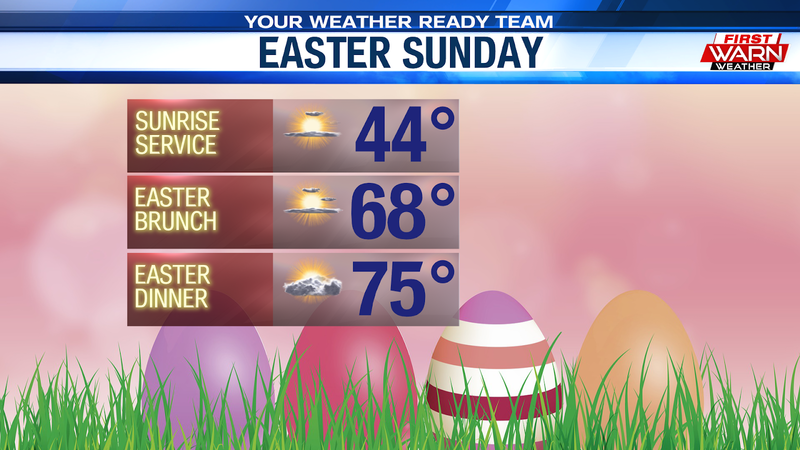 Last year Easter fell on April 1st and the high temperature that afternoon was only 32 degrees. It took a while for thunderstorms to break through the cap and materialize yesterday. 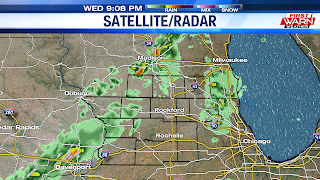 We dodged the severe weather threat as only a few strong storms formed right after sunset and moved into Southern Wisconsin. 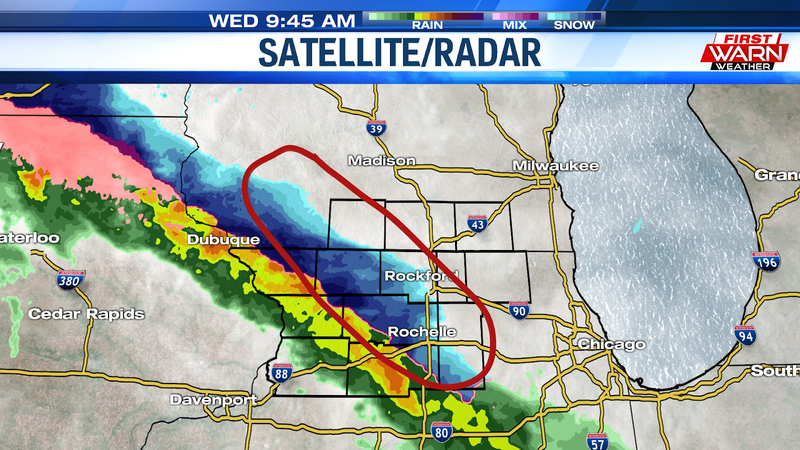 As we were all waking up this morning, a cold front was making its way through the Stateline. This has set the stage for a chilly, cloudy, and breezy day for the Stateline. 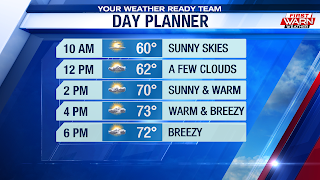 We have been mostly cloudy and breezy for most of our Thursday morning. 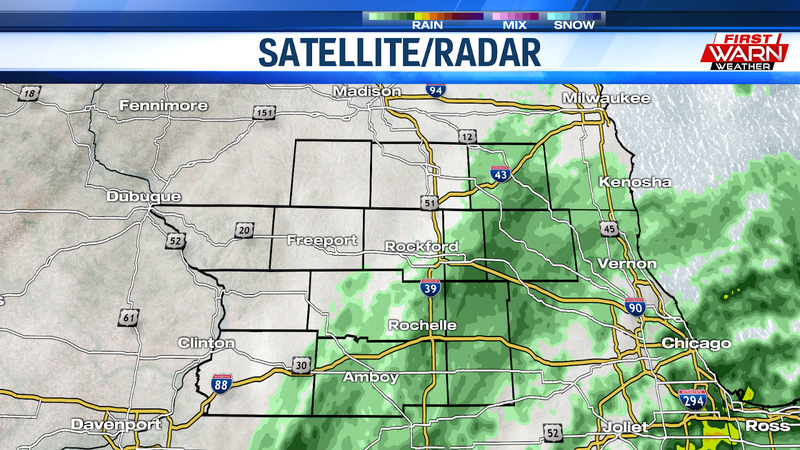 A recent look at satellite and radar shows a band of showers now moving through the eastern half of the viewing area. 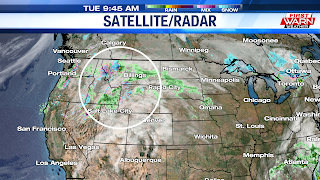 This is all due to a upper-level trough that is currently moving through the Great Plains. The shower activity should decline as we head into this afternoon. but a shower or two still cannot be ruled out. Did you enjoy the 75° temperatures yesterday? Well, we are sad to say that today is going to feel the total opposite. With the passing of this mornings cold front, temperatures will be fluctuating in the upper 40's-low 50's throughout the afternoon. 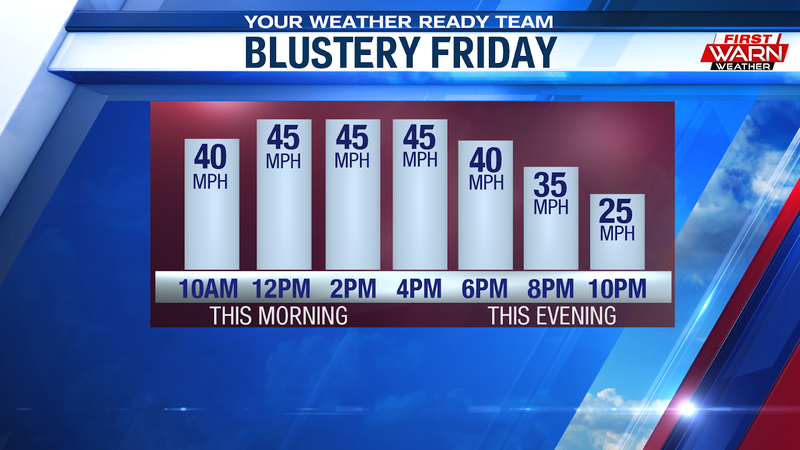 Not only that, its going to be breezy as there will be an uptick in winds this afternoon. 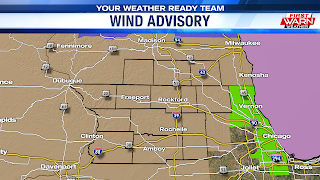 Winds will gust out of the northwest at 20 to 25 mph at times. 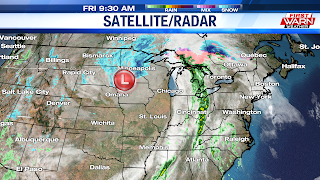 Now heading into Friday, a low pressure system will slowly track southeast of the region to start of the morning. This low will strengthen and deepen causing a tight pressure gradient at the surface. The tighter the pressure gradient is, the stronger the wind gusts. 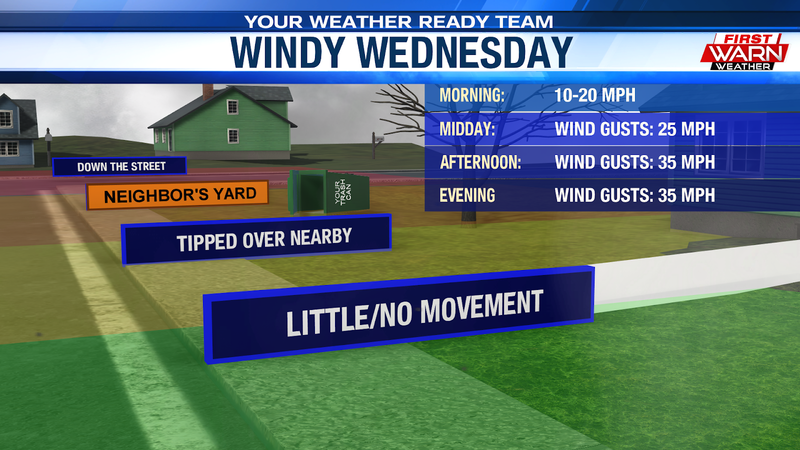 Tomorrow, we can expect wind gusts a little bit stronger than today. Temperatures stay below average as well making it a chilly and windy start to the weekend. 9:10pm Update: Our overall severe threat has pretty much come and gone Wednesday evening. While an isolated strong/severe storm can't be ruled out only a few showers and isolated storms are expected during the overnight. Storms over the southern Plains will lift northeast after Midnight impact parts of central Illinois early Thursday morning. 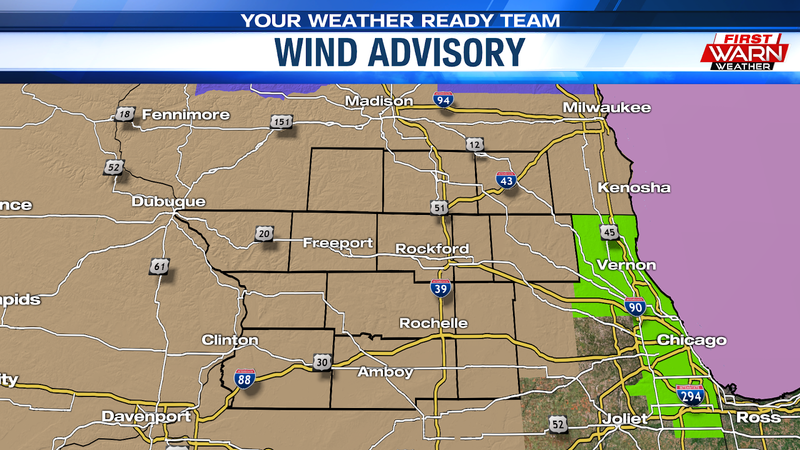 Those could produce some gusty winds but the biggest threat looks to remain south of I-80. A few showers will last into Thursday morning with mostly cloudy skies expected Thursday afternoon. 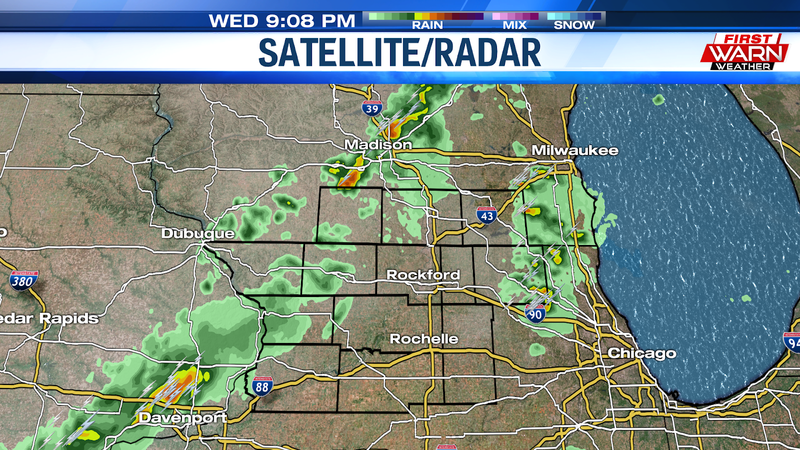 Isolated thunderstorms have developed Wednesday evening over northern Illinois and southern Wisconsin. 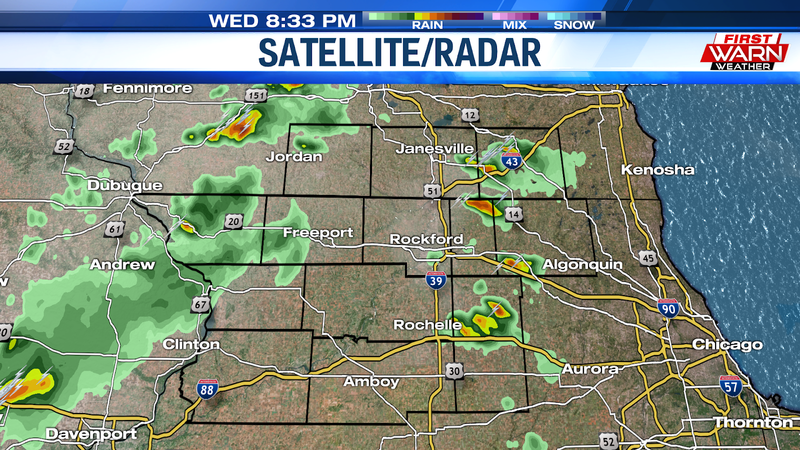 The storms have remained below severe limits, but did produce pea to penny sized hail in Beloit and South Beloit. 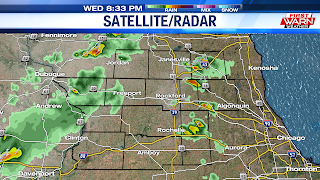 Isolated thunderstorms continue to move east of I-39 this evening with a line of weakening showers and thunderstorms moving into eastern Iowa. The severe threat continues to quickly decrease this evening as a cold front advances from the west. Thunderstorms developing over the southern Plains will lift northeast overnight into central Illinois. These storms will pose a wind threat but mostly south of the area and are expected to move in after Midnight. 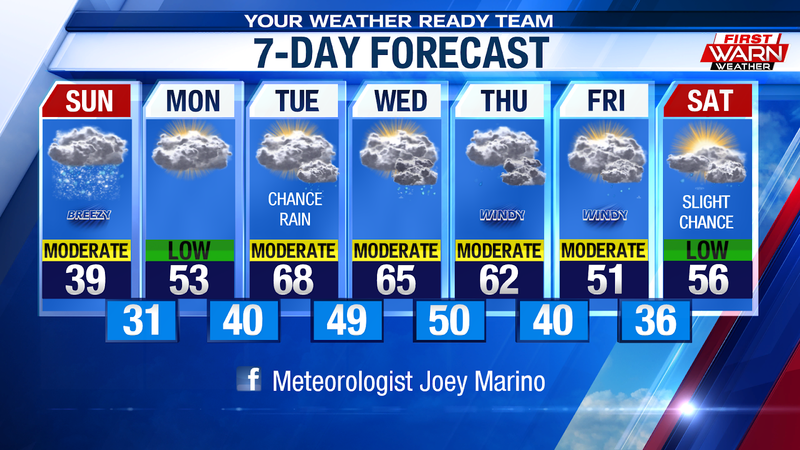 A few showers will linger into Thursday with temperatures holding steady in the mid and upper 50s. After almost having a "sunny & 75" forecast yesterday, our attention turns to the potential for thunderstorms this evening. 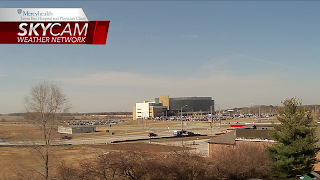 The Storm Prediction Center (SPC) in Norman, OK has placed the Western half of the Stateline is under a Slight Risk, while the other is under a Marginal Risk. Now, don't pay attention to the category. 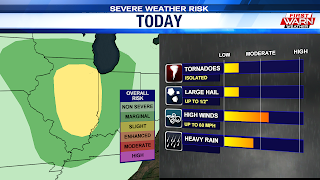 Just know that there is the potential for severe weather throughout this afternoon and evening. 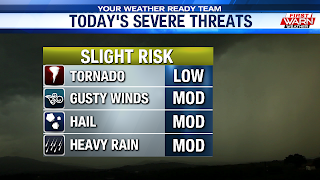 There are two key features that we need to keep an eye on for today's severe weather potential. 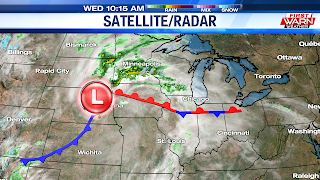 The first is the stationary front in central Illinois, and the second is a low pressure system out in the Midwest. Models continue to show this stationary boundary lifting northward as a warm front. 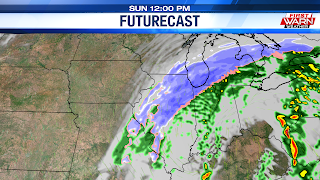 If this does occur, the viewing area will be placed in the warm sector of the low pressure system. 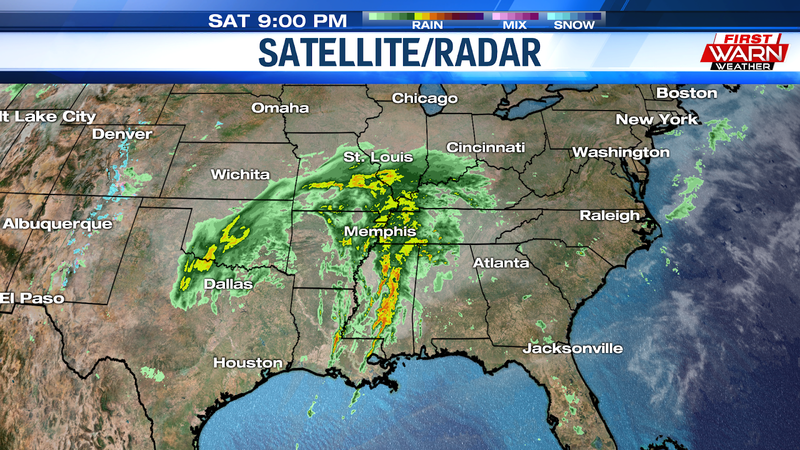 This is where a large amount of moisture and warmer air is brought up from the south. This will provide a potent environment for severe storms to form. With that said, if the warm front fails to lift north and stays to our south, than that drops our severe weather chances drastically. 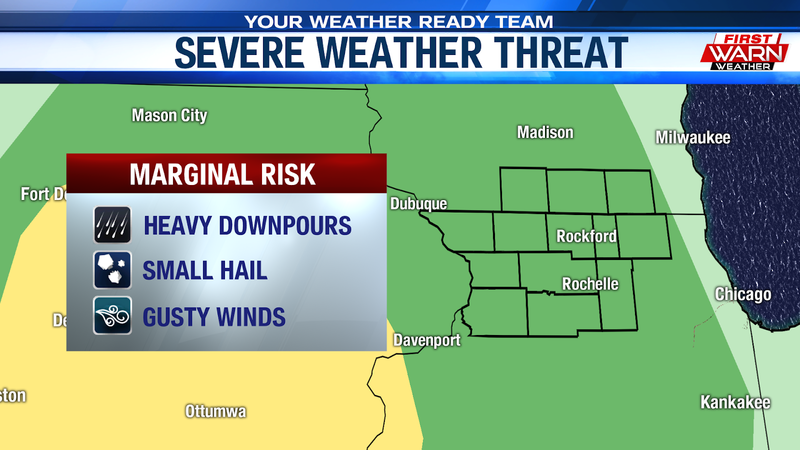 There's one other factor into whether we will encounter severe storms this evening. 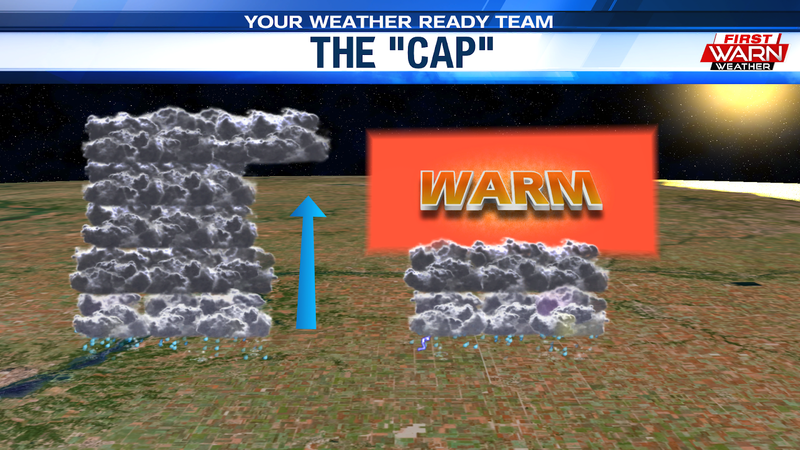 It's something meteorologists call "the cap". Normally, temperatures decrease the further up you go in the atmosphere. But sometimes, there will be layer of relatively warm air aloft, usually several thousand feet above the surface. This acts as a blocker and delays the development of thunderstorms. 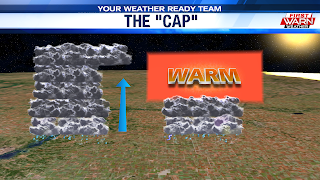 Thunderstorms rising into this warm layer become much cooler than the surrounding air, which inhibits their ability to rise and fully mature.If thunderstorms can break "the cap" this afternoon, the severe weather potential for our area will increase. 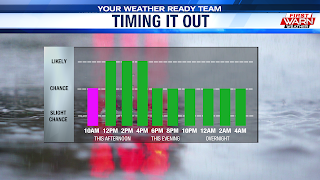 The time frame in which we have the best chance to see severe thunderstorms will be from 4 PM to 11 PM. 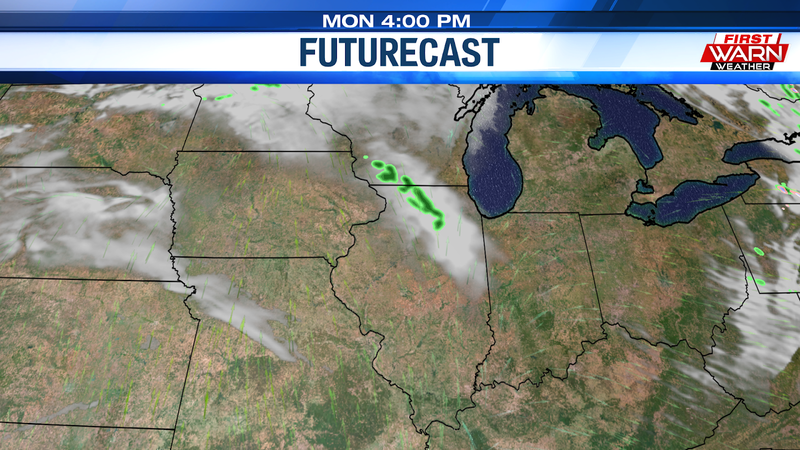 Storms will initially develope out to our west. They will then move in during the evening commute, so make sure you take your time heading home this evening. 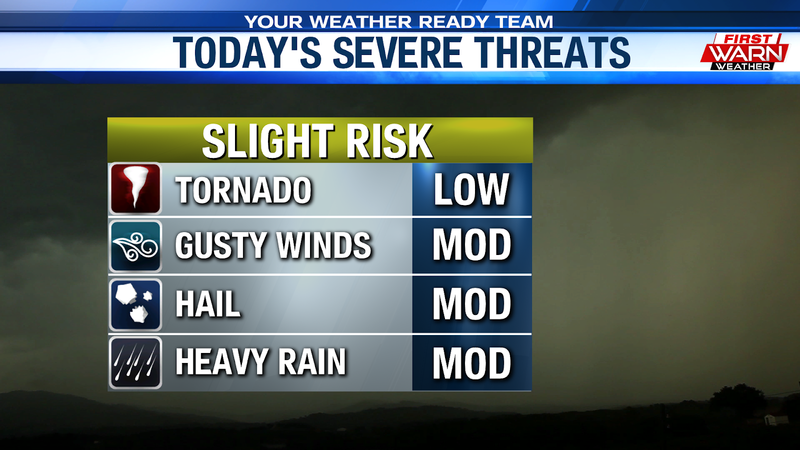 Most likely will see gusty winds and large hail, but a tornado or two cannot be ruled out! And with severe weather in mind, here are a few severe weather safety tips. Always have multiple ways to receive watches and warnings issued by the National Weather Service. That could be with a weather radio, your local meteorologist, or on your cell phone. Then, make sure that you have a safe place and a severe weather kit ready to go! 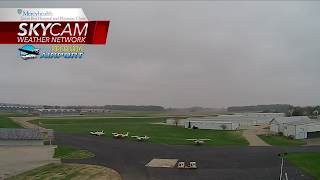 We had a bit of a wet start to our Tuesday as a few scattered showers came in from the west and quickly passed through the Stateline. 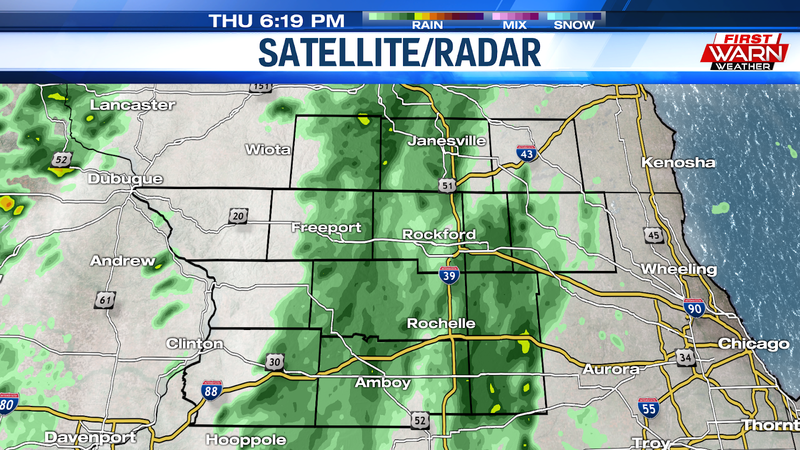 These showers were very light in intensity and wasn't heavy enough to cause slick conditions on the roadways. Once they passed well off to the east, sinking air in the atmosphere caused a few breaks in the clouds allowing some sunshine to peek through. With the suns help and also light winds out of the south, temperatures this morning have already risen into the 50s. High temperatures this afternoon will top out in the mid to upper 60's. Enjoy the dry weather now, because we will see rain and thunderstorm chances in the forecast during the next 3 days. The Storm Prediction Center has our entire viewing area in a Marginal Risk. A marginal risk is the lowest category (level 1 of 5) for severe weather. A higher threat for severe weather persist to the southwest in the Enhanced Risk (level 3 of 5) that stretches over portions of Oklahoma, Texas, and Arkansas. This is where you have the right conditions for tornadoes to form. For us in the Stateline, a warm front will lift over the region tonight into tomorrow morning. This frontal boundary could spark up a few showers during the overnight hours. This places our northern Illinois counties within the warm sector of the mid-latitude cyclone. The warm sector is the area between the warm front and the cold front. This will set the stage for an abundance amount of warm moist air to be pulled in from the south. Creating a prime environment for showers and thunderstorms to form. 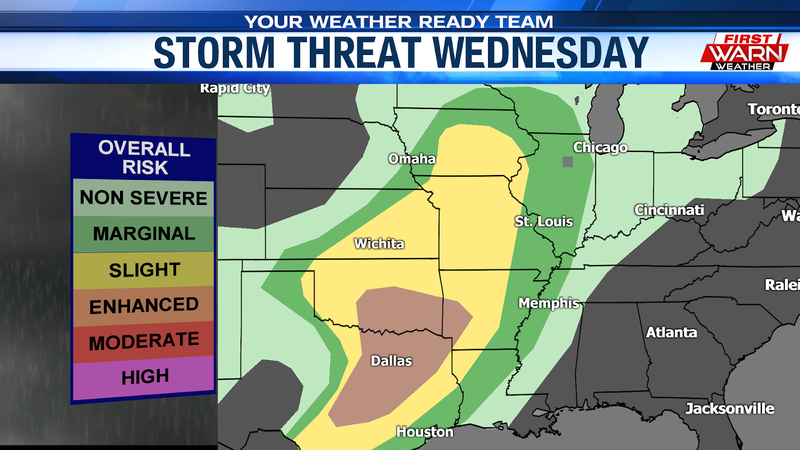 Our best chance for severe thunderstorms comes between Wednesday evening and Thursday morning. 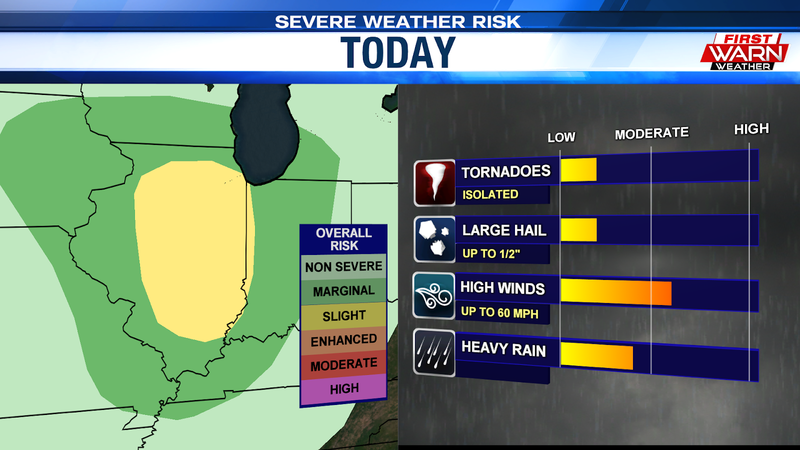 The tornado risk is low, but we do have a good chance to see heavy downpours, small hail, and gusty winds. 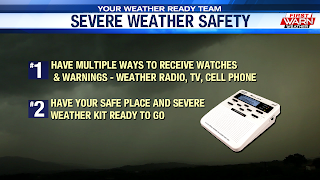 Remember to have a multiple ways to receive watches and warnings during a severe weather event! 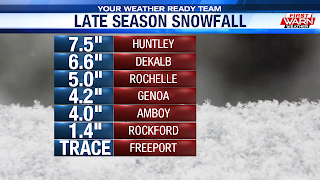 A late season snowstorm brought over half a foot of snow to some in northern Illinois Sunday afternoon and evening. 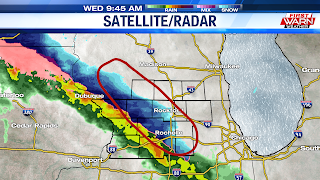 The heaviest snow came down over McHenry, Ogle, Lee and DeKalb counties where anywhere from five to eight inches of snow was recorded. 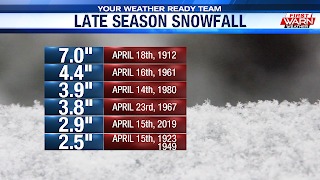 Northwest of that line snowfall totals were considerably less. 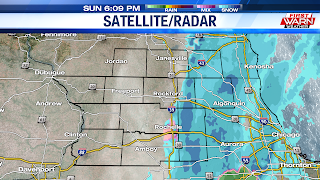 The snow will continue to come to an end from west to east between 6pm and 8pm Sunday evening. There may still be a few flurries that linger into the evening but skies should turn partly cloudy overnight. Temperatures will fall into the mid to upper 20s by Monday morning. Quite a bit of warm air will move in from the west and southwest just above the surface Monday, but the warmth will be tempered a little by the snow still on the ground. 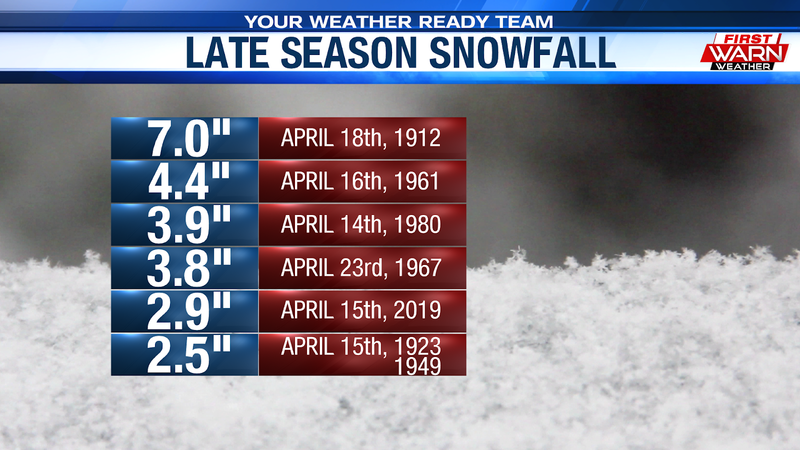 Good news, however, the snow won't last more than a day or two. 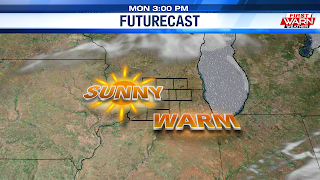 Highs on Monday will warm back into the 40s, to near 50 degrees. 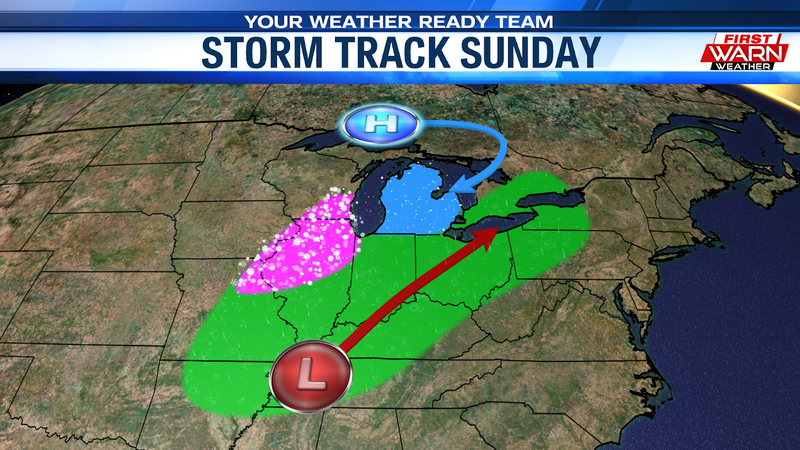 Saturday featured spectacular weather with plenty of sunshine and temperatures in the low 50's, but winter looks to pay a visit yet again to the Stateline for the end of the weekend. 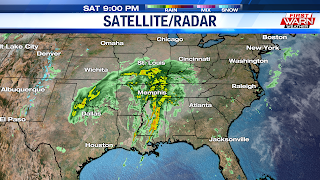 And it all begins with this potent low pressure system that brought severe weather, including a couple of tornadoes, damaging winds, and hail, to parts of the deep South. 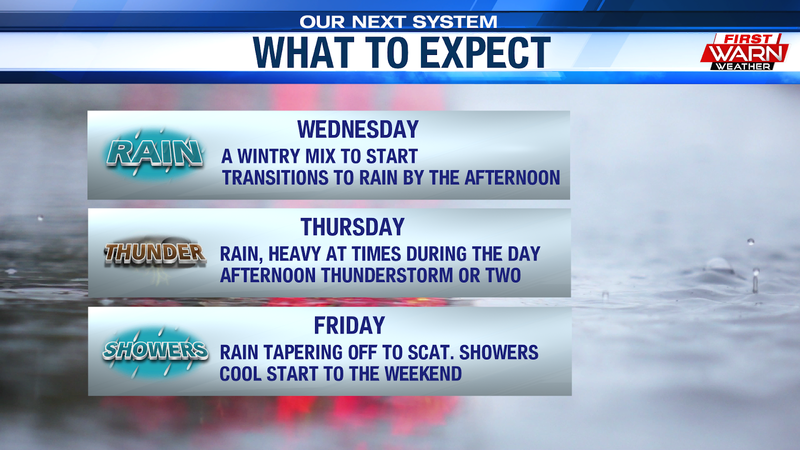 Now, we won't see any severe weather with this system, but instead, a does a wintry precipitation. 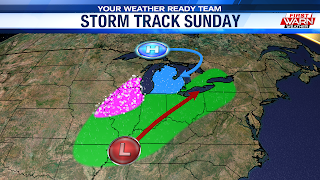 This potent low pressure system will lift to the north and track to the southeast of the viewing area. While doing so, a high pressure system off to the north will be pumping in cold air from the east. This will aid in the formation of a wet and heavy snow at first, then transitioning to a wintry mix later on in the morning. The snow will be a wet and slushy type snow as we could expect as much as an inch or two of snow with higher accumulations off towards the south and southeast. Pavement temperatures remain too warm for much in terms of accumulation, but if snowfall rates are able to reach maybe an inch per hour, it could be enough to overcome the warm temperatures. 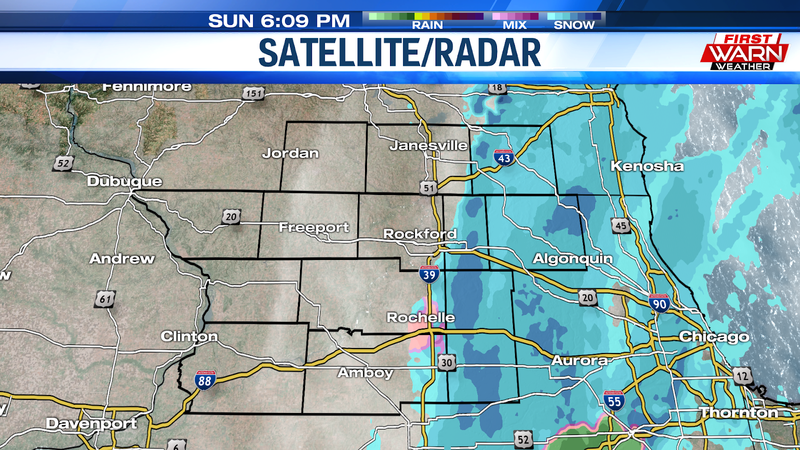 The snow will quickly accumulate on grassy surfaces. There is a light at the end of the tunnel as temperatures on Monday climb into the low 50's. This should melt away any of what is hopefully winter's last last last last stand. 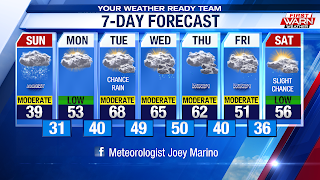 Then we warm up into the 60's starting on Tuesday with a chance for some rain. 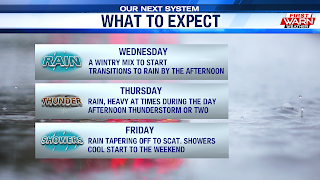 Rain stays in the forecast as well as a chance for thunderstorms through Thursday. Then we will cool down into the 50's after a cold front pass through Thursday night! 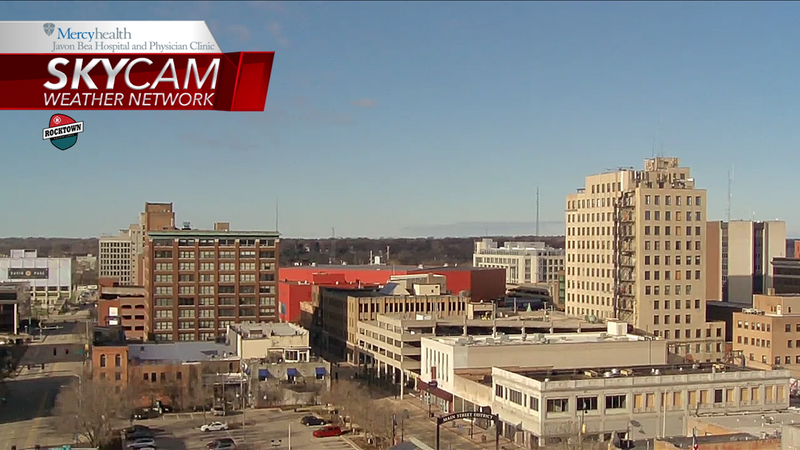 It's been a few days since we have seen the sun here in the Stateline. Winter paid a visit on Wednesday, and a cold front brought thunderstorms to the region yesterday. As we take a look at our Mercyhealth skycam over downtown Rockford this morning, it's definitely a B-E-A-UTIFUL start to our Friday. 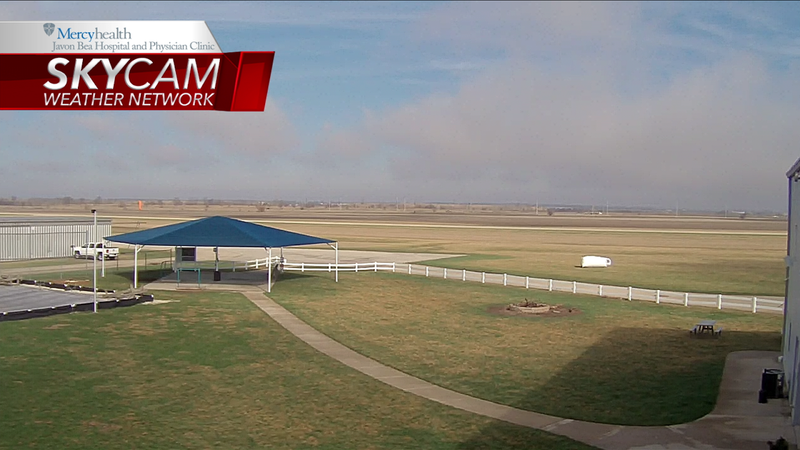 Dry air aloft has allowed clouds to clear out for now! 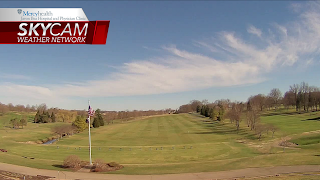 But, as we head into this afternoon, cloudy and windy conditions will return to the region! 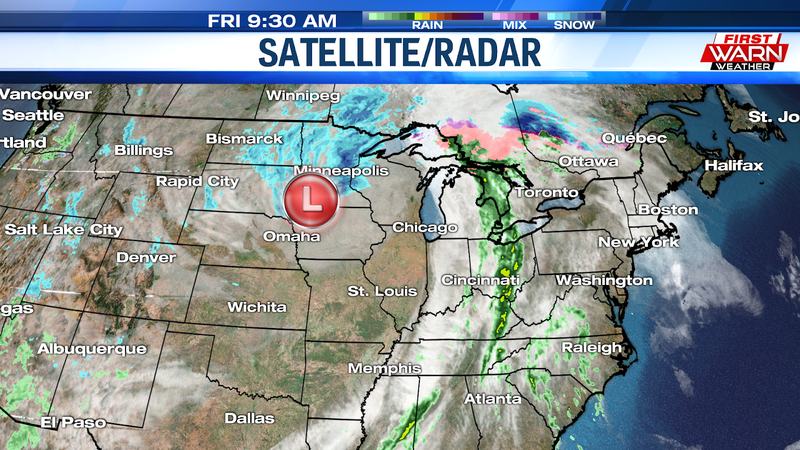 Winds are going to pick up this afternoon, all because of a strong low pressure system located in southern Minnesota. As this low strengthened and deepened the past few days, it created a tight pressure gradient in the atmosphere. The tighter the pressure gradient is, the stronger the wind gusts will be throughout the area. 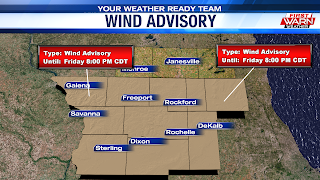 A Wind Advisory is now in effect for all our Northern Illinois counties until 8 PM this evening. We can expect wind gusts up near 45 mph this afternoon. Winds this strong could make driving difficult out there, especially during the evening commute.Any high profile vehicles should use extra caution while driving out on the roads today. 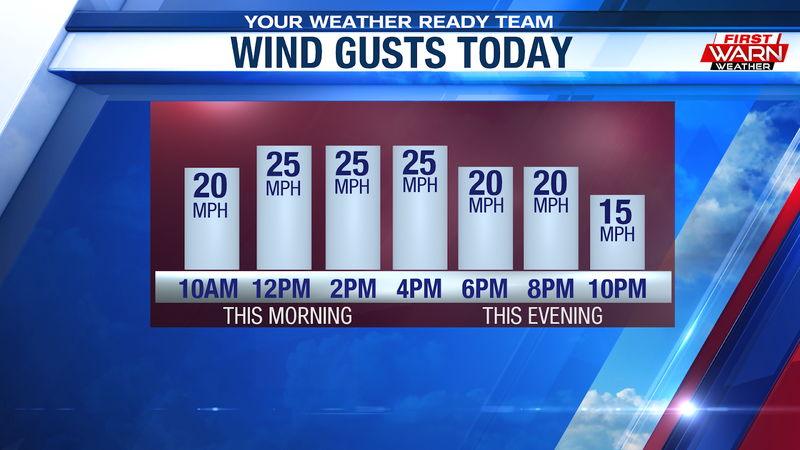 Timing out the winds today, winds will already be pushing 40 mph by 10 AM. 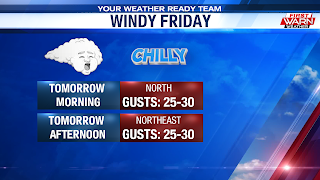 By noontime, winds will ramp up close to 45 mph. And that's where they will stay for the rest of the afternoon. As we head into this evening, winds will lighten up a bit as the low pressure continues to exit the region. We can still expect windy conditions overnight tonight with decreasing clouds. Non-severe showers and thunderstorms have been lifting north across northern Illinois and southern Wisconsin Wednesday evening. Thunderstorms earlier in the day produced pea sized hail, but all storm activity has remained below severe limits. A cold front approaching from the west has allowed a line of storms to develop over eastern Iowa. Those storms will quickly race east as the cold front crosses the Mississippi River between 10pm and Midnight. A warm front lifting north from central Illinois will keep a low end threat for stronger thunderstorms through sunset, but the greatest risk for severe weather will remain south. Biggest risk with any storm Wednesday evening will be gusty winds. 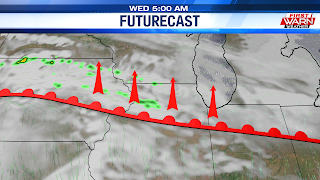 The cold front will pass after Midnight leaving skies mostly cloudy heading into Friday morning. After old man winter paid us a visit yesterday, windy conditions made their way in overnight last night into this morning. 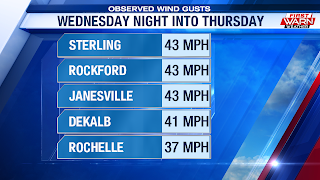 Wind gusts topped out between 40 to 45 mph in most spots across the Stateline. 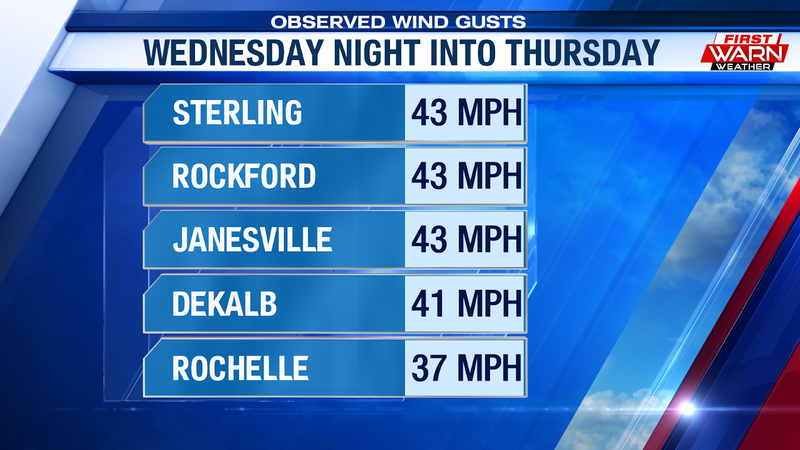 Our top reports came in from Sterling, Rockford, and Janesville with an observed wind gust of 43 mph. 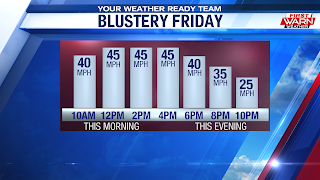 As we continue on into our Thursday, winds will still be packing a punch gusting between 25 to 30 mph! 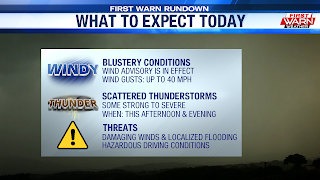 Aside from the blustery conditions, storms are likely this afternoon and evening. We are currently seeing the first wave of thunderstorms move through this morning. Frequent lightning has been reported as well as pea-sized hail in Dekalb County! 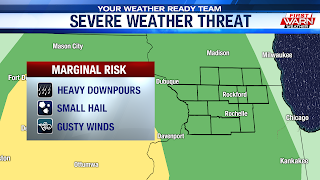 Heading into this evening, there is the potential for storms that could be strong or even exceed the severe category. 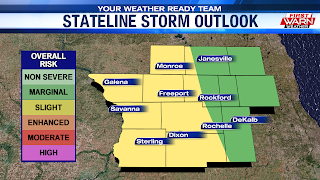 The Storm Prediction Center out in Norman, OK has placed Dekalb, Lee, parts of Ogle, and Whiteside counties under a slight risk (yellow) which is the 2nd lowest category for severe weather. 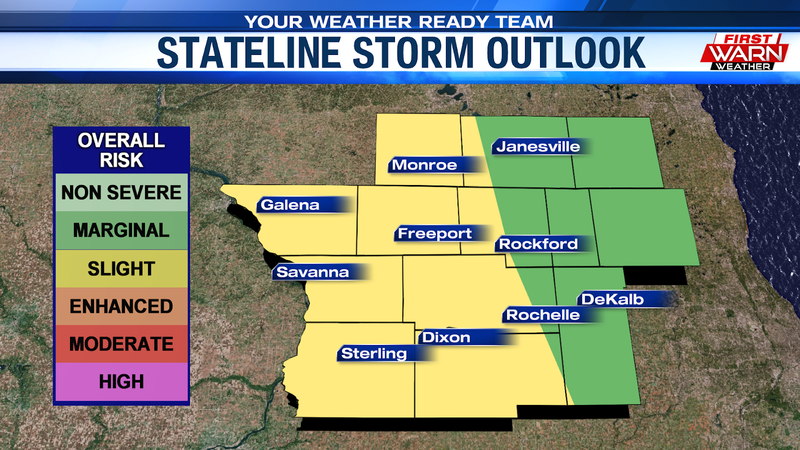 The rest of the Stateline could see a marginal severe weather threat. 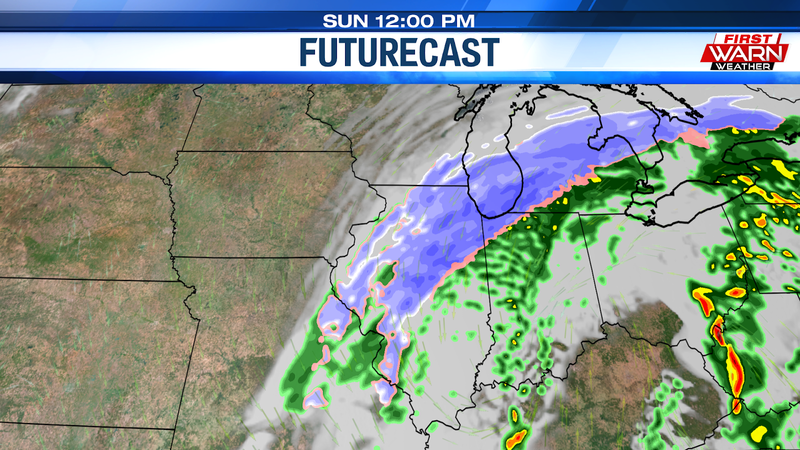 A warm front associated with a potent low pressure system will lift into northern Illinois this afternoon. Once it does, we will placed under what is known as the "warm sector" of the low pressure system. After a chilly start, this will temperatures rise into the mid to upper 50's as we head into this evening. With the thunderstorms that form along the warm front, some could take on some rotation which could lead to a low tornado and hail threat. There will be a chance for thunderstorms around the evening commute. However, the co-main event won't move through till around sunset. 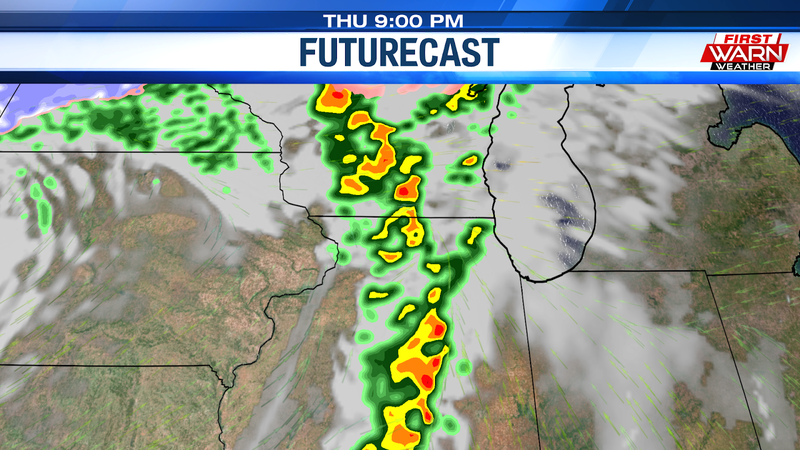 Then, another line of storms, or the main event, will form ahead of a strong cold front. The storms with this front will be linear, meaning that they will merge into a line of thunderstorms. The biggest hazard we can see with these storms will be damaging winds and heavy downpours. 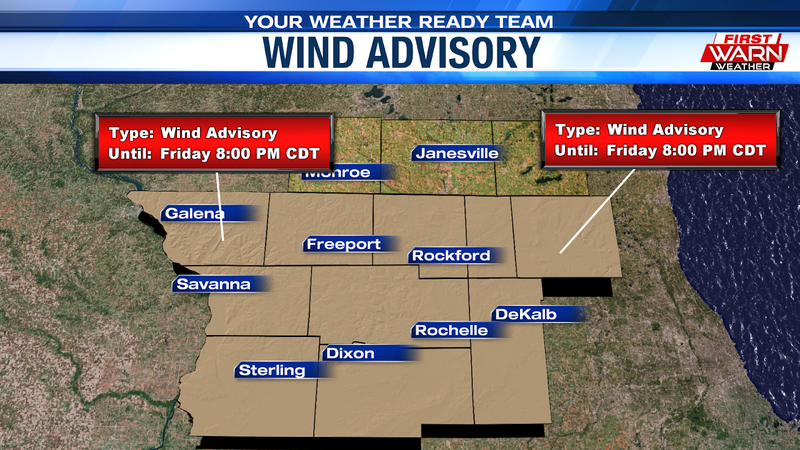 A Wind Advisory has been issued for all of northern Illinois and southern Wisconsin lasting through Thursday. Northeast winds have been increasing Wednesday evening as low pressure strengthens over the central Plains. Sustained winds are anywhere between 20-30 mph area wide, but wind gusts have been close to 50 mph over northwest Illinois! Strong northeast winds will continue into Thursday before relaxing a little by Thursday night. The strong winds will make travel difficult Thursday, especially with high profile vehicles. 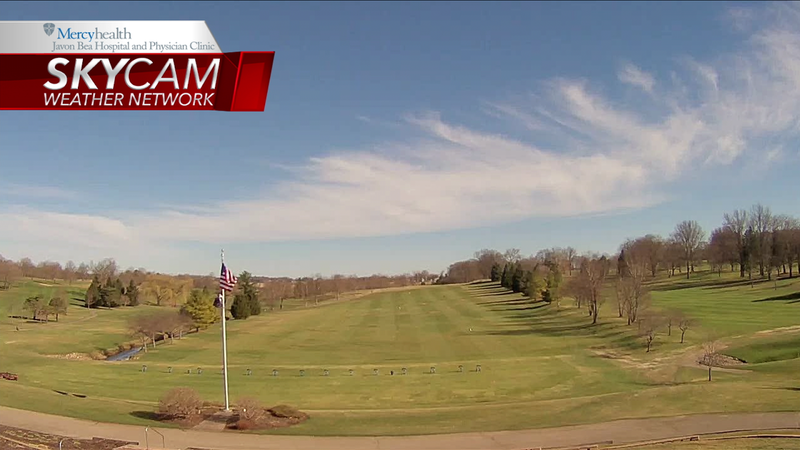 It's been a beautiful stretch the past 4 day with temperatures above 60° and some sunshine. But, we are sad to say that winter is paying a visit today. A cold air mass dropped temperatures into the low to mid 30's this morning across the viewing area. 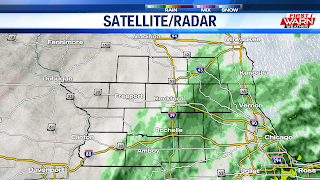 As a band of rain continues to lift to the north, it has started to encounter the cooler air allowing for some light snow to form. With that said, we expect a winter mix to arrive between 10 AM and 12 PM before everything switches over to rain by the afternoon. 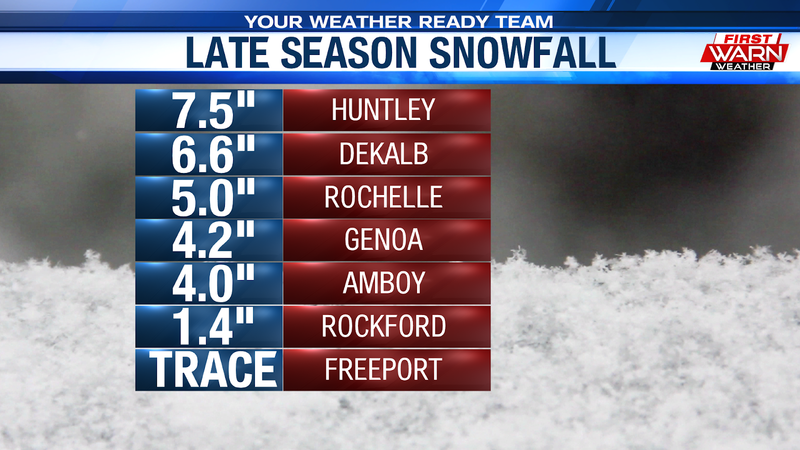 Snow accumulations will be very light and it shouldn't have any impacts on driving conditions. 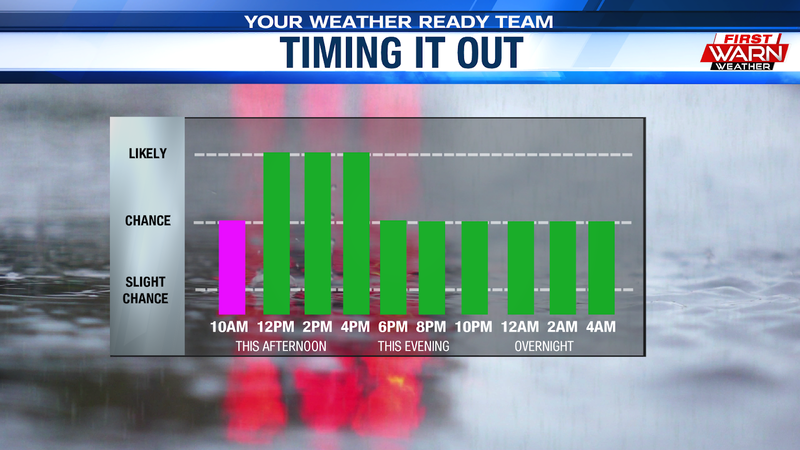 Rain will be likely from noontime up until 4 PM this afternoon. Then we will see some dry air work its way in this evening, but we will continue the chances for some showers into tonight. Not only will we be dealing with the rain, but it's also going to be a windy. Winds right now across the viewing area range between 10 to 20 mph. As we head into this afternoon and evening, wind gusts will ramp up to 30-35 mph and that will continue overnight tonight into tomorrow morning. 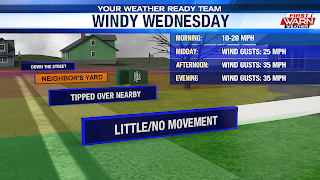 So, if you have any empty trashcans or loose objects around your yard, it would be a great idea to bring them in as winds this strong could blow them into your neighbors yard! 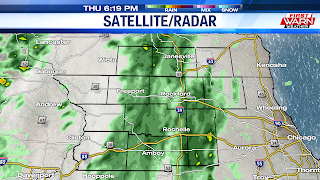 Stay dry Stateline! Good Morning Stateline! Today will feature somewhat of a repeat of yesterday. Yesterday, we got to experience what a beautiful Spring day is like with temperatures in the low 70's and lots of sunshine. The only exception to today would be, temperatures will be slightly cooler today after a cold front came through earlier this morning. 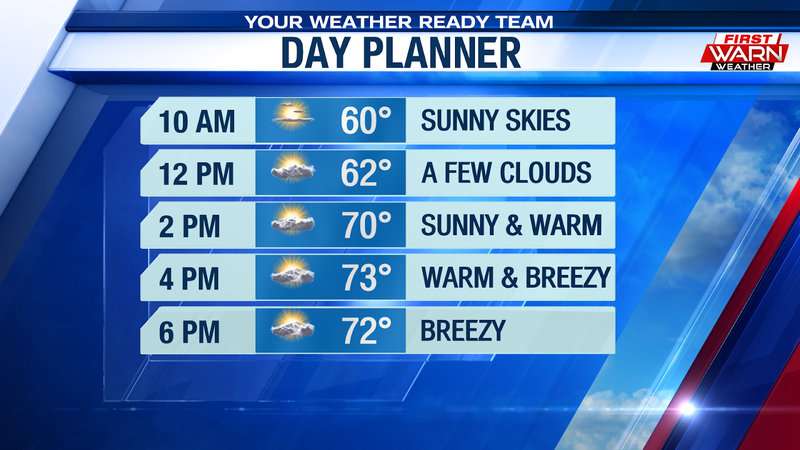 Other than that, it's going to be another beautiful day across the Stateline with abundant sunshine and breezy conditions. Winds will occasionally gust up to 25 mph at times this afternoon with highs topping out in the low 60's. Now, this is the time of year where a lot of yard work is getting done, but in the dry and breezy environment, a fire can start up and spread rapidly. Enjoy the sunshine while it last because we won't see it again until later on this week. A strong low pressure system will come in from the west and bring in much cooler and wetter conditions to the Stateline. Here is what to expect during the next few days. We will start off with a wintry mix tomorrow morning as temperatures look to start out just above the freezing mark. Now with how warm we have been the past few days, we don't expect anything to stick to the roads. Then as temperatures warm up, we will see it fully transition to rain by the afternoon. The cold front associated with this low pressure system will truck through the region during the day on Thursday. This cold front will heighten the chances for a thunderstorm or two especially during the afternoon and evening. In fact, the Storm Prediction Center (SPC) down in Norman, OK has placed a marginal risk (level 1 of 5) for severe weather on Thursday. Heavy rainfall and damaging wind gusts will accompany any severe thunderstorm as the cold front pushes through the region. 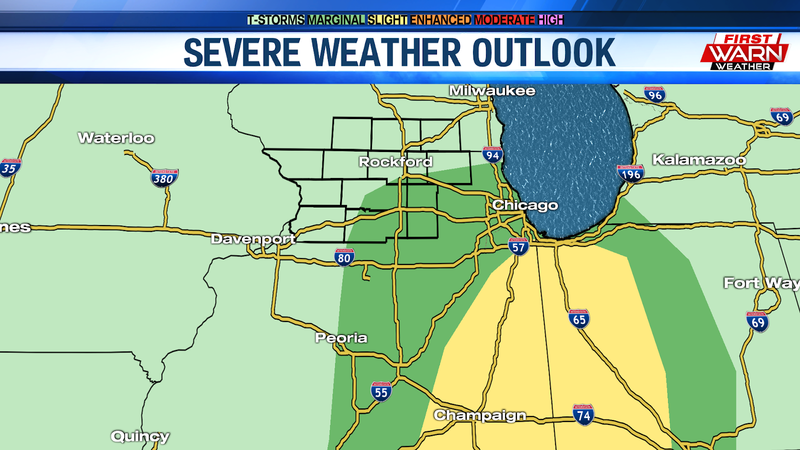 A higher severe weather risk will be down to our southeast and south of Chicago. As we continue into our Friday, rain will begin to taper off to a few scattered showers. Everything should taper off just in time for the weekend. Saturday and Sunday will be the next time we have an opportunity to see some sunshine with temperatures slowly warming back into the low 50's! 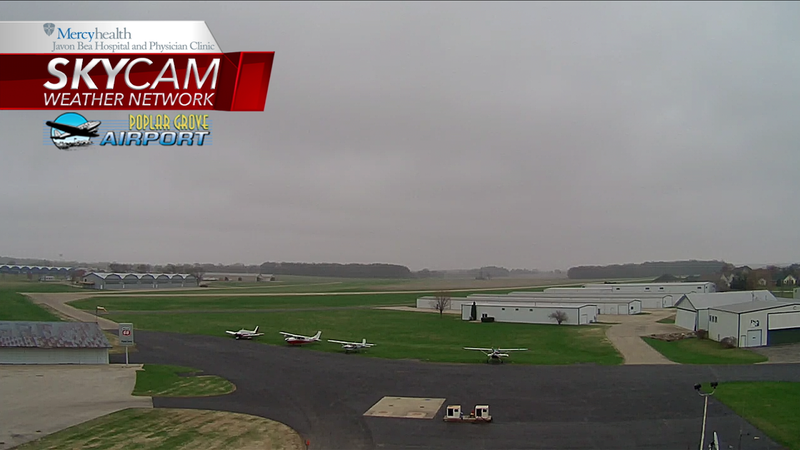 Skies cleared overnight allowing dense fog to develop across the viewing area this morning. Visibility is still slowly improving this morning with places off to our southwest still dealing with very low visibility. If you experience dense fog, make sure to use your low beams while driving out on the roads. Using your high beams could make it difficult to see what's in front of you. 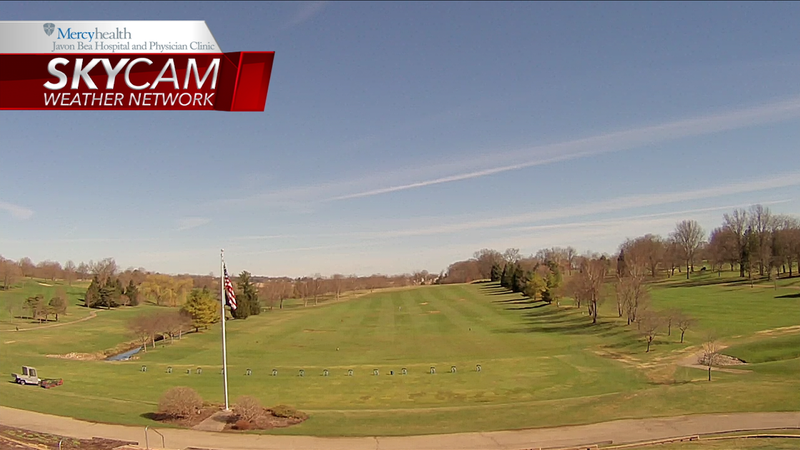 Conditions will improve as we head into the afternoon, with unseasonably warm temperatures and lots of sunshine! 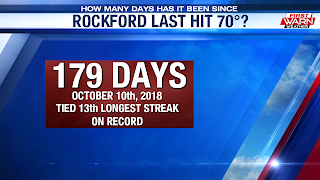 Now, it's definitely been a while since we have had a 70° day here in Rockford. 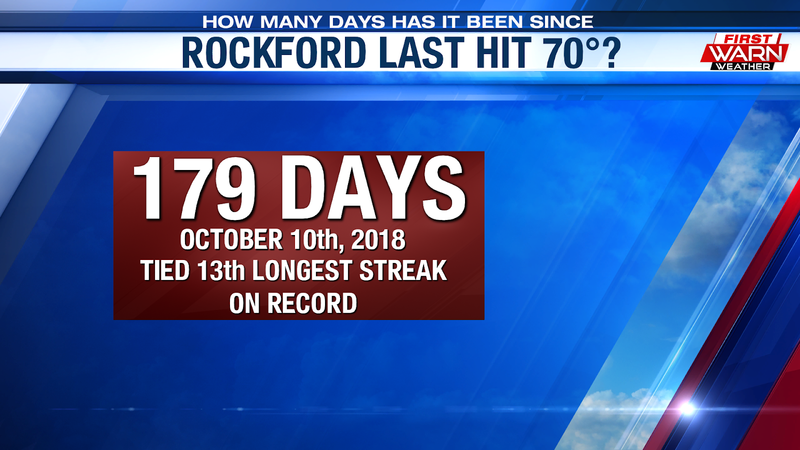 In fact, it's been 179 days since the Rockford airport recorded a temperature of 70° or more. We would have to go back to October 10th, 2018 when we hit 72°! This is tied for the 13th longest streak on record. Well, I am happy to say that this streak will most likely be broken today. The longest it took to reach 70° was back between 1960-1961 where it took 204 days to reach 70°. A high pressure system will move overhead today keeping the flow from out of the southwest. High's today will soar into the low to mid-70's. 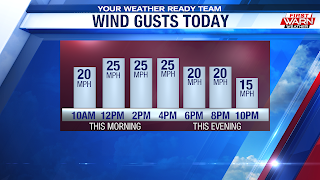 We can also expect breezy conditions this afternoon with winds gusting up to 20 mph at times. 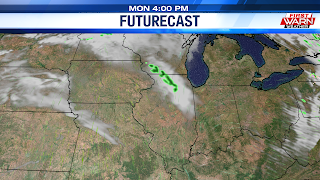 As we head into tonight, a few passing clouds are possible as a cold front passes through the region. It will definitely be a beautiful day to outside, take your dog to the park or for a walk, or maybe go to a baseball game. Speaking of baseball, both Chicago teams will be home today. 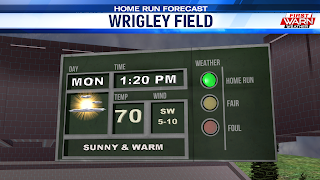 For the Cubs, it is their MLB home opener at Wrigley Field. They take on the the Pittsburgh Pirates at 1:20 PM this afternoon. 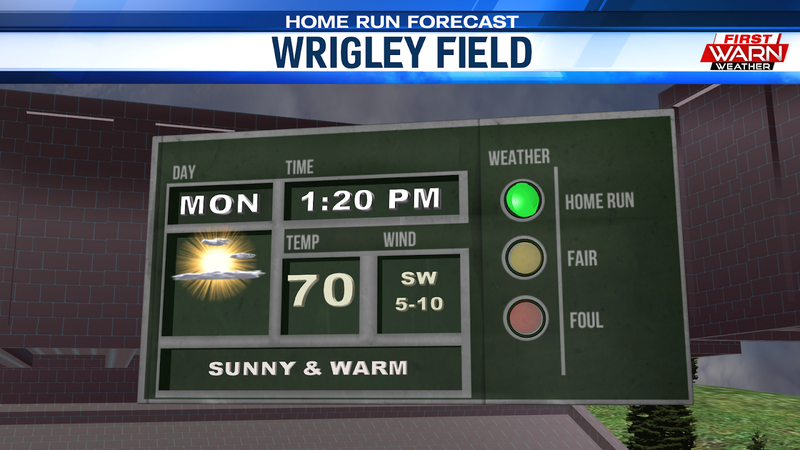 A beautiful day for baseball as temperatures at first pitch will be in the low 70's. Abundant sunshine with a light southwest wind at 5 to 10 mph. Go out and enjoy not only some baseball, but the beautiful weather!